Easy paperwork experience. Friendly customer service and convenient storage location. Facility is old but clean and safe. This is a great facility. Units are a very good value. I will recommend this place to anyone in need. I like the idea of only authorized prove being able to access the storage. No chance of lost or stolen keys being used. Easy access and helpful staff. Would recommend to anyone going through a difficult time. This is an average place to get storage from. The storage units are decently priced, but it is a little confusing to maneuver around and our storage unit didnât lock very well. We had trouble getting and and down because they have manual elevators and itâs difficult because the only person that can check people in has to be the one who signed off on the contract and In order to add new people the signer has to be there in person which, again, is a hassle. I didnât see wheelchair accessible areas (there might be some but I just didnât see any, although Iâm sure there are or maybe I missed it) and I wish there were other basic conveniences like bathrooms and water fountains, which I didnât see. Also they close pretty early. Then again you canât expect much from any storage unit. I do think this place has potential but I wouldnât recommend it if you have a super complicated situation like I did. Other than that itâs OK. Nothing too fancy. It gets the job done so if thatâs all you need, this may be the place for you. This is best place to stoarage I like it a lot. Very friendly staff gave a detailed tour of the storage building. This is my first time using a storage and I am so happy with my experience. The gentleman who assisted me was very helpful. I am a woman and I don't like to go alone so I am happy they have so many cameras. I feel my stuff is very safe there and the price is right! Thank you guys for making my experience an easy one. Everything was really clean including the bathroom. The place is nicely set up for easy use. My attendant was amazing ! He made me feel comfortable and relaxed during the entire process. Good place to keep your storage if you don't use it much. Place was clean and staff was very helpful getting me signed up & explained aspects of moving in. Don't change a thing with personnel, facility appearance and over all customer service. Good service. Great price. The building is clean and I feel secure in leaving my property here. This storage place is the highest of quality! 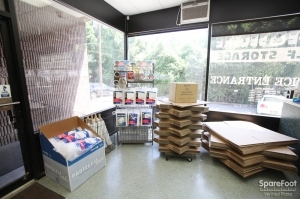 Everything you could possibly need for moving is here! They are great. Thank you for all your help. Safe and Secure is the #1 place to store your belongings! The units are affordably priced, well lit and very clean. The office smells amazing. There are plenty of handcarts to load up your stuff and SEVERAL LOADING DOCKS! The elevator is a massive freight elevator. I moved all my stuff in on one trip! Staff is very pleasant, I'm always delighted to see them! Thanks again Safe and Secure! Great customer service on the phone while booking as well as day of moving my items in. The space was very clean. Great job accommodating my needs. Great price. Friendly staff. Clean facility. Easy access into my unit. No complaints. This is my first time using storage and I'm glad I came to this place! Everything about this place is convenient. From the trollies to loading dock ramp and from the elevator to the units. The office is conveniently right behind the main loading docks and next to the main elevator, the staff is always so willing to answer my questions and guide me with information I needed to make the move easier. The prices are very affordable as well! This place gets two thumbs up and A++ for me! Best Self Storage in the area!! This facility is by far the best storage place I've ever been to! 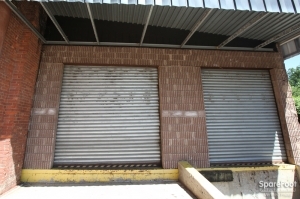 The units are well lit, immaculate, multiple loading docks, plenty of handcarts and a huge freight elevator! The staff is very pleasant and informative! Plenty of cameras in every aisle as well. I definitely feel my belongings and myself are "Safe and Secure"! I've been to so many other storage companies and by far this one is the best ! Great customer services, reasonable prices and very clean. This place was okay. I got the first month free through Sparefoot. Just so you know, they did not ask for my AAA card to give me the discount. It's clean and I had the option to upgrade to a space on the first floor. The hours of access were not ideal but I guess that does make the space seem more secure, right? They will sell you a $13 disc lock, so get one at Walmart before you arrive. Other than that, it's okay. This place is fine. It's clean and near my house. The price is okay because the first month is free. For now, it will do. This place is okay. Sparefoot got me a great first month price. They use disc locks and the hours aren't as long as I prefer, but it's manageable. There are many signs to find the office and it looked clean. This place is okay. Sparefoot got me a great first month price. They use disc locks and the hours aren't as long as I prefer, but it's manageable. Great service, paperwork took a little long but wasn't a bother, clean, locker looked good. When the place is open someone is always there so chance of robbery is low and is also well hidden from any main roads even better for that. Easy to make a reservation and move in. Staff was helpful and friendly, space was good. Wish they had extended hours but otherwise good space for the price paid. Love this place very clean and really nice people. This place also has reasonable prices compering to others. This place has the WORST and most HORRENDOUS customer service in the world, addition to the WORST elevator to move items into the storage unit. PLEASE DO NOT leave your belongings here. Even though at first they seem to present an affordable price, they incessantly increase the price EVERY six months or so. They have an antiquated payment service that can only be paid in person or via check thru bank transfer. The elevator is an old MANUAL elevator that requires physical pulling and pushing of 4 doors, to both get in, get out each time. The worst of it all is that the manager has a terrible attitude and refuses to understand what the customer is saying. On the day of the move, my mom had a terrible experience. After everything was moved out, my mom mistakenly forgot the lock in the unit door. The guy didn't ask for a key either when he went to check, but he refused to come back again to check and said she would have to wait for the next guy; she had to wait outside the dark unit for half-hour just waiting for another guy to show up to "check" that everything was out. Btw, my unit didn't even have a light on top of it, and was very dark and gloomy inside. She was also locked-in for a short time because the elevator got stuck, and nearly had a panic attack. 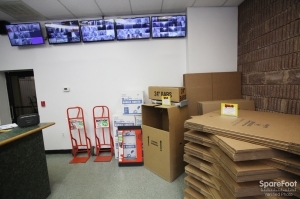 Overall, avoid this facility, and store your belongings in a place that has cleaner and brighter units, much better or even just decent bare minimum customer service, better payments and better pricing (possibly a place with a fixed pricing). I really, really regret trying to save a few bucks by using this place because my peace of mind and sanity is way more important. The service was great. Paperwork and move was easy. The storage space was good, mostly clean. The only thing was the elevator, if someone was using it we needed to go up the stairs to bring it down. In a regular day will be ok but in moving day we were so tired carrying boxes and furniture to uae stairs to get elevator. Only there was no 10 by 10 unit as reserved by spare foot. Safe and Secure had to give me a bigger unit honoring the price; however when 10'10 is available I have to transfer my stuff. That is not good at all moving is very difficult now I will have to feel like I am doing it again in a transfer. This Storage facility is very organized, clean and well run. Rooms are all steel walled and floors are clean. They have plenty of carts to help you get your things from the loading dock to your space. 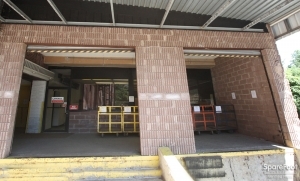 The facility has multiple loading docks. Good location and reasonably low prices!. Satisfied with customer service. Despite the location storage place is ok. We choosed this one because of the price. Quality of the storage unit the same like in the other places. The only thing different than in other places it is the lift. It is old fashioned industrial style lift with the manual gates. It's ok with us. It doesn't bother us. Excellent experience. Have referred safe and secure to my real estate agent to further recommend. Facility is clean with easy access, access ramp to help with unloadung and helpful tools such as the hand trucks which make the move so much easier. Great experience on move in date beginning with pleasant gentleman at reception (Jose) who showed us the works and explained everything we needed to know. Storage unit was very clean and many conveniences. i like the people that work there. it is a friendly place. the are friendly. I chose this storage because it was cheaper compared to other storage businesses. I asked the staff for a little help but he refused to help because he says he is not allowed to do so. I understand they want to stay away from troubles but that was disappointing. Everything is fine but thr only problem is with yhe elevators because old fasion and i dont think its secure too. Everyone I've spoken to at the facility has been very courteous and professional so far. Safe, dry, and easy to access. 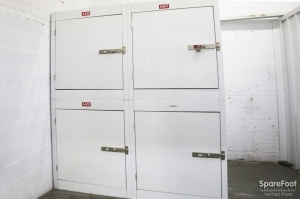 Easy to access storage units. 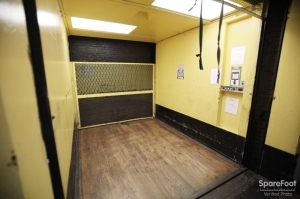 Huge freight elevator makes getting to the upper floors simple. The muzak piped through the speakers on every floor makes being up there alone a little less creepy ;) Good place to keep your stuff. So far so good. No complaints. The guys who work here are very good. Very good customer service, very clean and easy to access. Highly recommended. 5 starts on cleanliness given the fact that the building is quite old and they have made it very clean and structural. 5 starts on the carts that they have to use. These are REAL loading carts, not plastic crap caster messes. There are nearly two dozen of them- big wheels, large deck, tall back wall, solid and carry a heavy load. There are so many carts that I never have to wait. The freight elevator takes some practice to line up but that's the only draw back to this facility so far. Helpful people without bad attitudes every time I've been there. Great moving in experience. Flooring was kind of dirty and dusty, but overall as expected. not bad, the place seems to be upkept & pretty secure. The unit was clean & appears to be safe. first time renting a storage unit, it was what we expected. Overal I had a good experience. I rented a space at this location because of the loading dock. Had the cheapest rate within the area. Staff were welcoming and helpful. Facility was clean and easy to find. I was very happy to find this location - staff us friendly & knowledgeable. Everything is clean & well lit. Great price for a reasonable space. The location is fine and the buildings are reasonable clean and safe. Really loved the price, got a 5x10 unit for 14 months at a cost of $900. Averages about $65 a month, much better deal for the space than I saw anywhere else. 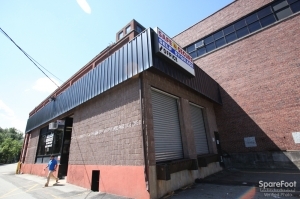 This place has a slow and kind of difficult freight elevator and our unit was dirty when we moved in - we had to ask for it to be swept - but the staff was friendly and helpful and on the whole, I'd recommend it. As soon as I walked in I was immediately assisted. They young man was very courteous and patient with me. They did not have the size storage room I had reserved so he gave me a larger one for the price of the smaller room I had reserved. He took me personally to show me where the storage room was located. 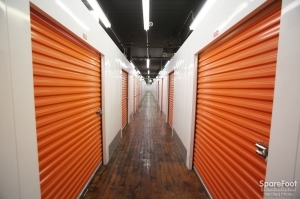 (Every other storage facility direct you)..will definitely recommend to family and friends. Everything is okay except the ancient freight elevator you have to use if you aren't on the first floor. We recommend. Very satisfied and not complaining. 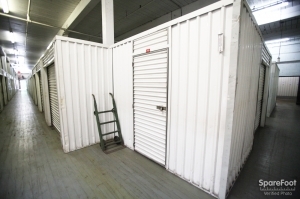 Very helpful personnel and overall can say -- "So far, so good"
Excellent pricing for storage! Honestly, I couldn't find anything that beats them. The storage itself is very clean and spacious for the price. Customer service is OK; over the phone, they are very polite but they incorrectly booked my reservation. Also, in the office, the hardly ever answer the phone. That being said, they are very polite and professional. I am going on deployment for a year. This facility gave me a military discount which I appreciate. Everyone was helpful. Awesome facility, very easy to use. My family and I were in and out in no time and we were very pleased with the space we rented. Pricing is great, clean,and secure facility. Was able to move in without any issues, customer service was great and fast. 5 STARS .....HUGE STORAGE FOR HALF THE PRICE OF EVERY OTHER STORAGE COMPANY I APPROACHED !! The employees treated us with such respect. They were super-helpful. I feel my stuff will be safe there. The Peolep there were very nice and helpful. It was clean and easy to get to. I would recomend this storage company to all my friends! great value for price and promotion. they do have carts available but wheels are falling off of the mattress cart making it very difficult to maneuver, I asked the attendant for a ball pean hammer to knock the axle back into one of the wheels. he said he didn't have one. his only solution was to find another cart and there were no other of that type. Average storage space, low price, shady neighborhood, secure place - i saw 1 private security car around the space when I was moving stuff. Month to month, a little too much paper work. Additional insurance does not cover your stuff, however i did see dents in the wall between adjacent storage spaces so not sure what the additional insurance covers. A little surprised about extra cost of insurance and had to buy their lock. Very helpful staff. Lots of loading Carts. Large elevator. Well climatized. Very clean. Excellent value. Employees were very helpful and were able to answer all my questions. I just wish they had a place to dispose the garbage instead of taking it with me all the time. Everything was just fine with the exception of the entrance door to the facilty being locked the 1st 3 times I went there. I was unable to check in (May 3rd)because the manager would not accept my driver's license because he felt that he could scratch off the film that covers it. I am a frequent flier and go through airport check points at least twice a week and I have never had any TSA agent question the validity of my driver's license, I also presented a veteran ID and would not even consider it. He told me he would have the owner call me the following week (Monday/Tuesday), today is May 13th and have yet to hear back. I since rented another unit else where and I am very pleased and yes, they did take my driver license as an ID with out any questions. Great experience with good customer serveice only delay in setting up acct. was slow computor system partly due to our paying for years in advance. Manager was a great help an answered all our questions. 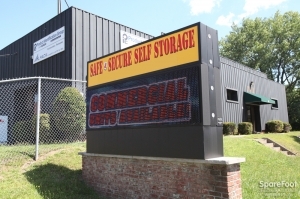 I justed became the proud tenant of a storage unit at Safe & Secure Self Storage on Lanza Ave this past weekend. Wil made the paperwork process painless and fast and then I moved in. The facility is clean and the elevators are a treat, although a slight pain to have to wait for a while at times. I attempted to walk up and down but was informed that that was not an option. All in all everything good. Helpful staff made the process very easy. The storage unit is competitively price, a bit out of the way but the cost savings make it worth it. The personnel at this location are the best!! So far, things have gone very smoothly. If there were multiple movers on the same day it could be a problem getting the elevator. Good space for good value with good service. This is my first storage and everything went smooth. Thanks for the Staff treated me courteoustly and explained me the whole process.Highly recommend this place. This is a very nice storage facility. Perfect for my small business. Manager, Alex, was extremely helpful, courteous, friendly and professional. My move finished before closing, but he had offered to stay open and wait for the movers to finish when we weren't sure when it was going to be finished. Highly recommend this place. Excellent pricing, too. I was treated courteoustly and they walked me through the process with ease. They really rock. No need to look further. . I work for TV network storing sitcom scenery and props here. NYC cant touch these rates. Half hour drive and savings MAJOR bucks. Very helpful and curteous staff. The owner of the company called to rectify any issues that I had with the company.. He went above and beyond to make me happy again which he has done. I appreciate his professional approach and his desire to restore our business relationship. Thank you! Good job. I will recommend you to my friends. I called EVERY NJ storage place within a 30 minute drive of the Garfield/Elmwood Park area. First...the rep I spoke to at Safe and Secure did NOT rush me off the phone like all the other places did. He understood this was my first time renting and I had lots of questions and concerns. He was extremely patience and courteous. I decided to reserve a 10x10 space on an upper floor to save some money. I received a prompt confirmation email with all the details. In fact, their rent price was $50 lower than the exact same space at two other nearby locations that I wound up visiting. I plan to rent for at least a year so I figure I'm going to save minimally $600!!!!!!!! I also used their free box delivery service. I got a confirmation phone call to be sure MY plans didn't change and then the delivery right on time. I also checked them out through the Better Business Bureau and found Safe & Secure has an A+ rating. I now understand why. It's like an extension of your home..
Just left review but it was cut off? When checking out my items the service suddenly got very rude. Will, the person that checked us out, was extremely offensive. I was disrespected and my service at this storage unit will never exist again. Very happy with price and service. Convenient, secure facility with excellent service! I was very please with the staff and the cleanliness and accessibility of the unit. The units were clean and spacious. It comes with a solid lock, and the elevator makes for easy access.